We have a small farm in Cairo Ga. where we raise rare breed chickens. We have decided to add rabbits to our little farm. Flemish giants. We are NPIP Ga. 57-1211. Please contact us at 229-234-0781 or wava1vaughn@gmail.com You can follow us on FB Bielefelders buy,sell,trade and auction and Thomasville Ga. Farm Swap. We check for eggs 3 times a day and store them at 55-60 degrees until they go in the incubator. 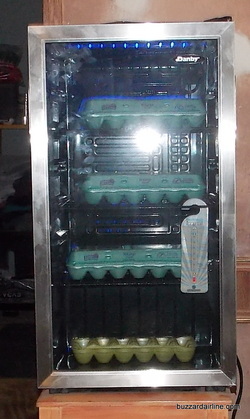 Every Monday our eggs are moved to the incubator or the refrigerator. We don't sell hatching eggs over 7 days old. ﻿"All Orders are filled with the freshest eggs"
We have chicks available for $3 each . Eggs are $10 per dozen . Bielefelders An auto sexing breed from Germany created in the early 70's from several breeds including Barred Rocks and Rhode Island Reds. Chicks- pullets $10 each cockerels $5 each + $60 shipping 6 week old pullets $20. 6 week old cockerels $10. Eggs $20/dozen + $20 Priority Mail shipping. Our Bielefelders lay an Extra large egg. Our original stock came from GreenFire Farms. sheep.We have been raising sheep for several years. Weaned Rams $125 and weaned ewes $150. We have St. Croix sheep. Shipping costs are figured by weight and zip code. On live birds (chicks) it's $60 Priority Mail Express that includes the box. For juvenile and adult birds we have to calculate the costs. ﻿﻿﻿ A minimum order of 10 chicks is required for shipping. If you want us to hold a specific date for eggs or chicks we require a non refundable $50 deposit. The deposit will apply to the cost of your purchase. If we can't deliver on time your deposit will be returned. Due to the post office changing their rate policies and we are now using Foam egg shippers we have raised are shipping rates on hatching eggs to $20. To simplify the use of the Buy Now button all sales are under chickens even eggs. Please don't pay until we check availability and give you a final price. PayPal processes all payments. You don't need to have a PayPal account to make a payment. Mar. 2014 From N.C. "I had an amazing hatch rate and BEAUTIFUL baby mottled cochins. THANK YOU so much for everything! J"